This report was put together each night by Antonio Lara, Founder of South Pacific Bowhunter Magazine and regular Bowsite.com contributor - as Paul Thompson (Paul T), Paul Woods (PaulW), Alan Specketer and Antonio headed south from Darwin for a buff and hog hunt. 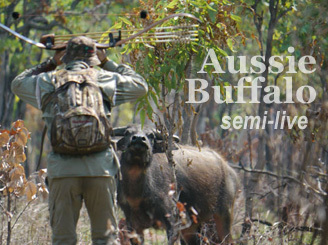 Follow along on their hunt each day as it happened for 8 days unguided hunting the Australian Bush. The Paul's and I flew into Darwin on Friday evening and had a great feed at Alan's where we were joined by Shane (Lemmi), the guy who took Pat and myself bowfishing for sharks last year. The boys had a few drinks and told a few funny stories, which is always to be expected when in fine company at the start of a highly anticipated trip. We woke early and after a heart starter at a roadhouse at 5am that consisted of marinated chicken wings, hot chips and a Gatorade, we headed south to meet the property owner. We spotted a cow buff just as we pulled up at the gate and it was to be the first of many sightings for the day. After meeting the property owner, we then headed off and spotted a mob of cows coming out of a creek. PaulT and Alan went one way and PaulW and myself went the other. We quickly came upon a huge bodied bull that had been polled years ago and ear tagged. It was a shame as he would have been a boomer had he not been polled. We called him Bluey Brown, due to one blue and one brown eye, as we became familiar with him during the day, spotting him a few times and mistaking him from a distance as a shooter before we glassed him. We then came across a bunch of cows and calves having a swim and we sat back took a few pics as they left the water. No takers here so we moved on. We headed out to the backcountry, as today was more a checking out of the place to see what areas we would target over the week. We walked creeks and found springs and glassed vast areas. We didn't see a lot in the heat of the day so we stopped for a quick fish at a nice lagoon. PaulT quickly pulled a black bream and Alan soon followed up with a tarpon. PaulW then hooked his dream fish, a first barra, before it spat the lure at him and he was burnt. After the fish it was getting late so we started heading back. We did not see any shooters, as this trip the two Paul's and I are all aiming to take a nice bull. Alan was keen to smash some hogs. We had passed a few animals, though it was a long day as no mature bulls were spotted except for old Bluey. It was then we came across a mob of big animals. It held a huge sweeper bull, another bomber with the typically curved horns and one big cow, along with a stack of smaller animals. Paul T was put up for the stalk and we all hastily tried to catch them as they moved and moved and moved some more. Man these things can cover some ground when they want to get somewhere. The two Paul's got very close and were ready to shoot when the angle was right. As they moved down a dry creek bed and PaulT started to rise to shoot, a lone young cow that was only 15m from him and out of his sight, spooked and took the others with them. It would have been a huge start to the trip had it come off, but after a bit of a follow up it wasn't to be. We were all a little dejected and headed back to the car. The day had been massive and it was so hot that I have never been in such heat at all, let alone walked kilometer after kilometer in search of game. On last light we headed to a spot where we thought it would be good for pigs on last light and we hit the jackpot. There was a big bunch of them, but of course the wind had its final swing and 30 odd hogs were sent packing and unfortunately none wore a shaft. We now know where we will position ourselves tomorrow evening and we are looking forward to that episode. That was it for today. We still have more new ground to check out and a couple of likely places to head back to. The buff on the place we are hunting are not as thick as in some areas and are pretty clued up. It is going to make for an interesting hunt and the week will be fun. The heat is seeing the animals in to their beds early and they are coming out late. We will be at it at first light in the morning to take advantage of the somewhat cooler temps. That's if you can call 32 degrees Celsius cool first thing in the morning. We are expecting the day time temps to hit 40 degrees Celsius so we are looking very forward to that. Tune in tomorrow night for another update. This is an Unguided Hunt sponsored by South Pacific Bowhunter Magazine!